The kitchen calculator (also known as a kitchen converter, kitchen unit converter, baking unit converter, or cooking unit converter) is a kitchen tool that can be used to help you convert the most common units used in cooking and baking. 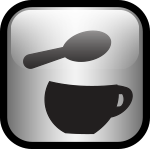 The kitchen calculator tool also has a conversion pad that helps you keep track of recent conversions and allows you to edit or add notes. See the instructions below or visit the How-To section for details on how to use the kitchen calculator. 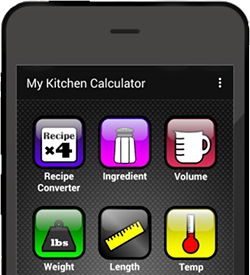 You can also download the MyKitchenCalculator.com App (currently only available on Android and Kindle devices), which includes most of the conversion tools found on our website and additional tools such as an ingredient unit converter that allows you to convert between volume and weight measurements for more then 250 ingredients! To hear about the latest updates to our site or app, follow our Facebook page. Harness the power of recipe conversion! 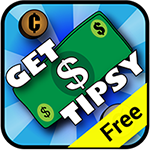 For a LIMITED TIME, we're reducing the cost of the app to just 0.99 USD. Get the app today before this offer expires! How do I save a conversion? 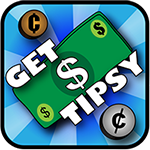 If you eat out, this tipping calculator app is a must have! The volume unit converter allows you to convert between the most common volume units used in cooking and baking. Some of these units include: teaspoons, tablespoons, cups, pints, quarts, gallons, fluid ounces, milliliters, and liters. Enter a starting value between 0 and 1,000,000. Press the start unit US/UK button to toggle between a start US or UK unit, and select a start unit. Press the desired unit US/UK button to toggle between a desired US or UK unit, and select a desired unit. The unit conversion will appear in the conversion area. The weight unit converter allows you to convert between the most common weight units used in cooking and baking. Some of these units include: grams, kilograms, ounces, and pounds. Choose a start unit and a desired unit. The length unit converter allows you to convert between the most common length units. Some of these units include: millimeters, centimeters, meters, kilometers, inch, feet, yards, and miles. The time unit converter allows you to convert between the most common time units. Some of these units include: seconds, minutes, hours, days, months, and years. The temperature unit converter allows you to convert between the most common temperature units. Some of these units include: Celsius, Fahrenheit, and Kelvin. The temperature converter also displays Gas Mark temperature references. Enter a starting value between -1,000 and 1,000. Select a Gas Mark number from the dropdown selection box. The temperature reference will appear in the conversion area. 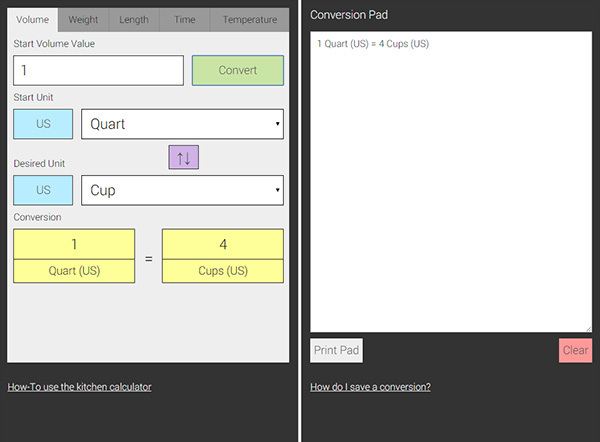 The conversion pad text area will display a history of the most recent unit conversions. The contents of the conversion pad can be edited, printed, or copied and pasted into a document. Fractions can be entered as a value. When using fractions, separate whole numbers from fractions with a space. One and one-half = "1 1/2". Volume conversions are based on rounded values and are not exact. This converter may not be suitable for engineering, scientific, or mathematical purposes. The year unit is based on a standard 365 day period. The month unit is based on approximately 30.42 days.